[ Ralph Bartlett Goddard, American sculptor. ] Illustrated pamphlet advertising 'Portraits of Eminent Men in Bas-Relief', including extracts from letters from relations of Longfellow, Poe and Hawthorne. 4pp., 12mo. In good condition, on lightly-aged paper. The second page carries photographic reproductions of the bas-reliefs of Tennyson and Carlyle, in frames. The third page gives details of the twelve portraits (Carlyle, Tennyson, Hawthorne, Longfellow, Dickens, Whittier, Lowell, Thackeray, Bryant, E. A. Poe, Ambriose [sic] Thomas, O. W. Holmes), executed by 'Mr. RALPH BARTLETT GODDARD, the eminent Sculptor', stating that they are available in plaster or bronze, and 'form a most suitable adornment for the walls of a private or public library, schoolroom, or study'. [Printed pamphlet.] Saorstát Éireann. 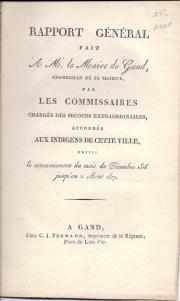 Report of the Commission on the Relief of the Sick and Destitute Poor, including the Insane Poor. Baile Atha Cliath. Dublin. Foillsithe ag Oifig an rSolathair. Published by the Stationery Office. To be purchased through Messrs. Eason and Son, Litd., 40 and 41 Lr. O'Connell Street, Dublin. 1927. 163pp., crown 8vo. xiv +  + 163pp. Stitched. In cream printed wraps. In fair condition, on lightly aged paper in worn wraps. With shelfmark, stamp and label of the Board of Education Reference Library. 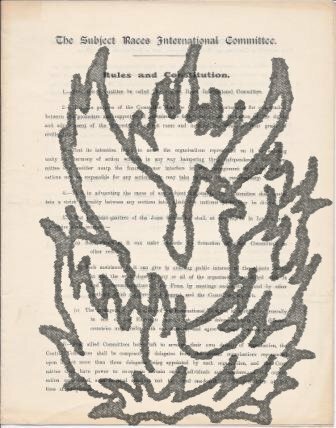 [British Parliamentary Bill.] Poor Relief (Ireland). 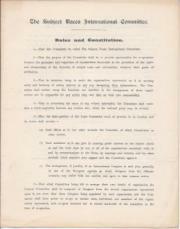 A Bill To make further Provision with Respect to the Relief of the Destitute Poor in Ireland, and for other Purposes connected therewith. (Prepared and brought in by Mr. Gerald Balfour [...]). Ordered, by the House of Commons, to be Printed, 7 August 1896. Printed by Eyre and Spottiswoode, Printers to the Queen's Most Excellent Majesty. 19 + pp., crown 8vo. Stitched. 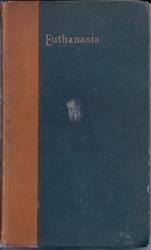 In good condition, lightly-aged and with slight staining at head of back cover. With stamps and shelfmarks of the Education Department Library. Scarce: no copies (other than on microfilm) on either OCLC WorldCat or COPAC. [Richard Oastler, Tory radical.] Autograph Letter Signed to an unnamed editor, regarding the proof of his 'sayings of last Monday'. 'Mr. Tathams'. 27 March 1839. 1p., 12mo. In good condition, on lightly aged and worn paper. He has just 'received notice that the Mansfield meeting will be held on Thursday at 12 o'clock - & the Sutton meeting on Saturday at One O'clock.' He continues: 'If you intend to insert any of my sayings of last Monday, I should feel obliged by a sight of the proof, if consistent with your official regulations'. [Sir Thomas Dyke Acland.] Autograph Letter Signed ('Thos. Dyke Acland') to an unnamed recipient, explaining how he has ceased to make charitable payments to the widow of an artist 'labouring under loss or decay of sight'. From the Waterloo Hotel, on his crested letterhead. 10 June 1863. 4pp., 12mo. Bifolium with mourning border. In good condition, on lightly-aged paper, with slight traces of glue from mount along one edge. A hurried letter, illegible at points. 'You will see the name of yr. respectable at the end of the enclosed Petition from My Own Hand. She has no right to refer to me for any further knowledge of herself and her husband, or his position of art - than that of my having understood him to be an artist in a state of much distress, labouring under loss or decay of sight, & that I for some years I might almost , I gave him occasional relief. London: Printed by Charles Bill, and the Executrix of Thomas Newcomb, deceas'd, Printers to the Kings most Excellent Majesty. 1695. + 14pp., 8vo, with the text paginated 349-359. Disbound. Good, on aged paper. At the head of the title, in a contemporary hand: 'Relief of poor prisoners'. The title carries the royal crest, and reads in full: 'Anno Regni Gulielmi II. Regis Angliae, Scotiae, Franciae & Hiberniae, Septimo & Octavo. | At the Parliament begun at Westminster the Two and twentieth Day of November, Anno Dom. 1695. [Broadside] Civil and Religious Liberty. THe following Letters, by Sir John Maxwell Tylden, are submitted to the consideration of the MEN OF KENT. George Wood, Printer (herald Office) High Street, Canterbury [1828 [Milsted, 18 Oct. 1828]. One page, folio, fold marks, closed tears at fold, stained at edges, mainly good condition. Two letters, one addressed "To the Right Honorable Lord Haris, the pother "To the Opponents of Emancipation", both expressing trenchant opinions pro Catholic Emancipation, the Catholic Relief Act being passed in 1829. Tylden also had radical views on Reform. 4pp., 4to, bifolium, good condition. It includes a list of the executive elected for 1908 (H.W. Nevinson, Mrs N.F. Dryhurst and others) and of "Names of Affiliated Socities ... with their Representatives" (including the Aborigines Protection Society, Friedns of Russian Freedom, Georgian Relief Committee, National Council of Ireland and others). A space has been left for "Co-opted Members". P.3 comprises "The Rights of Subject Races", four clauses including adherence to the Hague Convention of 1907. P.4 is blank. No listing on COPAC or WordCat but informative references on Googlebooks. 4pp., 4to, bifolium, good condition. It includes a list of the executive elected for 1908 (H.W. Nevinson, Mrs N.F. Dryhurst and others) and of Names of Affiliated Socities ... with their Representatives (including the Aborigines Protection Society, Friedns of Russian Freedom, Georgian Relief Committee, National Council of Ireland and others). A space has been left for Co-opted Members. P.3 comprises The Rights of Subject Races, four clauses including adherence to the Hague Convention of 1907. P.4 is blank. No listing on COPAC or WordCat but informative references on Googlebooks. [Book.] Euthanasia: or, Medical Treatment in Aid of an easy Death. By William Munk, M.D., F.S.A. London: Longmans, Green, and Co. and New York: 15, East 16th Street. 1887. 12mo, vii + 105 pp. In original cloth quarter-binding of brown spine and blue boards, gilt. Fair, on aged paper, in patchy worn binding with foxed endpapers. With the ownership inscription of the Great Yarmouth solicitor Frederick John Dowsett (author of 'Both Sides of Jewish Character', Westminster Review, 1888). 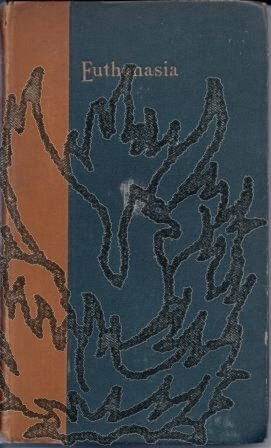 An important and scarce early work in the nineteenth-century resurgence of interest in the subject in the West. [Printed.] 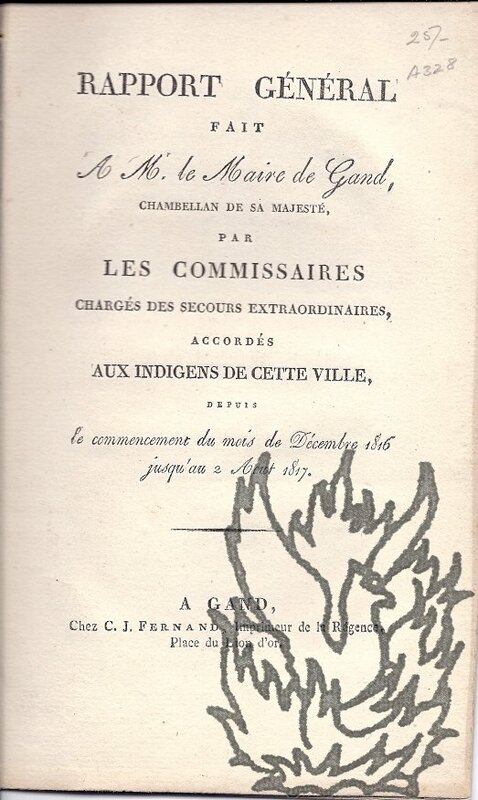 Rapport Général fait a Mr. le Maire de Gand, Chambellan de sa Masjesté, par les Commissaires chargés des secours extraordinaires, accordés aux Indigens de cette Ville, depuis le commencement du mois de Decembre 1816 jusqu'au 2 Août 1817. 8vo, 15 pp. Disbound. Text clear and complete. Good, on lightly-aged paper. The opening paragraph makes clear the theme: 'Les pluies continuelles venaient d'enlever au cultivateur ses plus chères espérances; la récolte avait entièrement manquée, et ce désastre était commun à presque toute l'Europe: dèslors il fut facile de prévoir les malheurs qui affligeraient le continent et particulièrement la classe pauvre et sans travail jusqu'à la récolte prochaine.' Scarce. Neither printer nor place of publication stated. On both sides of a piece of paper roughly eight and a half inches by five and a half. Both sides of text enclosed within decorative border. A scare survival, in poor condition, worn and spotted with frayed edges and several closed tears. Text clearly legible. Headed 'FOR GRATUITOUS DISTRIBUTION.' Thirty-nine lines of text on reverse. Begins 'The following predictions of this venerable pillar of Church and State were at the time sneered at, as the senile and effete expressions of a bigoted octogenarian. What a lesson has he left to those who now hold the rudder of the State in their hands'. Typed Letter Signed to [Mary] Scharlieb, 149 Harley Street. 24 September 1919; on letterhead of the Professional Classes War Relief Council (Incorporated). Soldier, policitician, economist, eugenicist (1850-1943) and son of Charles Darwin. The recipient Dame Mary Scharlieb (1845-1931) was an early woman doctor. Two pages, quarto. Good, but on slightly discoloured and lightly creased paper, with staple stains to both top left-hand corners. An interesting letter concerning the efforts of Scharlieb's Committee to 'establish a Home where the wives of professional men could be certain to obtain excellent treatment at moderate fees'.